“Some people spell Christmas as s-t-r-e-s-s, but these holy days are gifts from God through which we stay connected to family and friends,” writes Hanby-Robie. So, how can we, in practical terms, keep the holiday simple? I came across an article entitled “33 Ways to Keep Christmas Simple and Meaningful”, written by Victor Parachin which state the issue much more effectively that I ever could. 1. Spend five minutes daily in silence. “Be still and know that I am God,” is the command of Psalms 46:10. Spending a mere five minutes a day in silence before God can bring you closer to the Spirit of Christ. 2. Plan ahead. Rather than operating on autopilot, doing the same thing year after year, be intentional. Gather your family and ask everyone what they really want to do and who will participate. A little planning can go a long way to reducing holiday stress. 3. Avoid debt. A major source of frustration is the accumulation of debt brought on by too much gift-buying. Resist the temptation to use a credit card unless you can totally pay off the debt in January. Rather than go into debt, keep gifts small and simple. 4. Claim the spirit of the Innkeeper. Be inspired by the one who opened his heart and stable to help Joseph and his pregnant wife, Mary (Luke 2:7). Like the innkeeper, help someone who is in a difficult place. 5. Feed Your Mind. Check into the background of some Christmas symbols- candles, evergreens, poinsettias, mistletoe and the advent wreath. You’ll be surprised at what you didn’t know about Christmas. 6. Organize yourself. Make a list of all the things you need to do. If it looks like too much, pare down the list to something more manageable. 7. Cultivate courtesy. Be courteous to sales personnel. Often they are tired and tense because of their long hours and impatient customers. Speak kindly to them. 8. Extend compassion to a stranger. Gladly let someone get ahead of you in a store line, especially if he or she looks frazzled. On a bus or subway, readily give up your seat to a person carrying packages. 9. Memorize scripture. Memorize verses connected with the birth of Christ. Two of my favorites are the words of Mary in Luke 1:46-47, “My soul glorifies the Lord, and my spirit rejoices in God my Savior.”, and the angels’ declaration, “Glory to God in the highest, and on earth peace, and goodwill toward men.” (2:14). 10. Just say “no”. You don’t have to accept every invitation. Say “no” to give yourself some down time. 11. Downsize your gift-giving. As the years go by, our gift list can grow and grow. Shrink your list to a size your budget and time can afford. 13. Exercise. A lot of frustration and potential weight gain during the holidays can be avoided by maintaining a regular exercise regimen. 14. Don’t become a slave. Rather than preparing your elaborate family meal all by yourself, ask for some help. By allowing others to pitch in, you make it more enjoyable. 15. Try new ways of sending Christmas greetings. You can save a lot of time and money by using Christmas postcards rather than the more expensive traditional cards. Consider sending this year’s Christmas newsletter and good wishes via email to those family and friends who have an Internet connection. 16. Send a card to someone who is incarcerated. Contact a prison chaplain to get a name and address. Let that person know you will be praying for him or her. 17. Light a prayer candle every day. In the privacy of your home, light a candle each evening. Whenever you see its flame, let it remind you to pray for someone in need. 18. Skip a meal. A few times in December, skip a meal. This simple fast will be a strong reminder what it feels like for many people who have to go without food. 19. Be considerate toward young children. Consider donating baby food, diapers, and clothing to a local organization which serves children and families in need. 20. Reflect on Philippians 4:4. This verse urges us to “rejoice in the Lord always.” Each day, pause to thank God for the blessings of that day. 21. Go vegetarian for one meal. In many countries around the world it is customary to have a meatless Christmas Eve dinner. This is done in honor of the animals that were likely present in the stable at Jesus’ birth. All of creation was blessed by Christ’s coming. 22. Practice patience. The holidays offer many opportunities to do this. Relax and be patient when the traffic is slow, the lines long, the service poor, or the clerk rude. Remember that “love is patient” (1 Corinthians 13:4). 23. Make amends. Reach out to someone who’s wronged you or someone you have offended. Jesus came to earth to bring forgiveness, so forgive others and receive their forgiveness. 24. Broaden your concept of “family”. Be inclusive at Christmas. Include in your family festivities and gatherings those who can’t be with their own families or who may not have a family to visit. Be especially sensitive to those who are single or single again. 25. Sing. It doesn’t matter whether you can carry a tune or not, when you hear a carol played on the car radio, sing along. When you’re in a mall and holiday music is played, hum along. Music is a tonic for a fatigued intellect and a stressed spirit. 26. Read about the original Santa Claus. Saint Nicholas was famous for helping the poor and reaching out to children. Visit a library and read about this remarkable man. 27. Pray for peace in the world. Sadly, many conflicts continue to rage around the globe. Focus on a country where there is war and regularly pray for peace to come. 28. Give a gift of money. Every Christmas one man gives a cash gift to three people who have been laid off from their jobs. He has done this for 20 years now, and therefore has brightened the lives of 60 families during the holidays. 30. Help fight world hunger. During the holiday season when most of us tend to overeat, consider giving away 10 percent of your holiday budget to an agency which fights world hunger. 31. Pray for each person who sends you a Christmas card. Cards often contain news about the senders. That information is a good basis for prayer. Offer prayers of praise for those who report accomplishments and prayers of help for those dealing with illness and loss. 32. Read a Christmas poem. There are many wonderful poems written about this season. Find some in the library or on the Internet. Read and reflect on their message. An early Merry Christmas everybody! 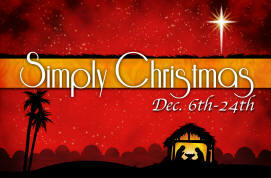 Let’s enjoy a very simple Christmas this year! One of my favorite ministry responsibilities is planning for the future. Sometimes the past bores me and there are times when the present frustrates me. But tomorrow, now that’s a topic I can embrace! Every fall, we enter into a time of dreaming and praying and visualizing about what next year holds for us. Specifically this week, I am zeroing in on some outreach and mission ideas for Maranatha Church for 2010. My preaching schedule and message sequence is pretty much set for the new year. Our activities calendar is already full. Now I get to work on some things that really get my heart pumping. We are strategizing about ways we can make the love of God obvious in our community. Things have changed in our culture and what worked a few years ago is totally ineffective now. A fresh approach is necessary. The needs have evolved, so must our efforts to reach people. One of the things that is at the forefront of my mind is our motives. We must reach out to people with pure hearts, not with ulterior motives. I think people see right through our expressions of conditional love and concern. We have to love and serve people as Jesus did; No strings attached. We will serve them in an effort to show them God’s love, but if they do not respond the way that we would like, we will still love and serve them. Our missions work will, as God allows, expand next year. We did great in ’09, but I have some goals that will take us well beyond what we accomplished in the past. I would like to expand in 3 areas: the number of people involved, the amount of money we give and the geographical areas we serve. It is all quite exciting! Who knows what the new year and new decade will hold? Only God! My job is to hear His voice today and everyday in order to follow Him and help others. I love planning for the future! Letha and I have discovered the way to a stress-free Christmas. It is only December 1 and we have already decided what we will be buying for one another this year. We have decided on the perfect Christmas gift! And we want to let you in on it early. We made the decision to purchase (drum roll, please!) a brand new, state of the art Sus scrofa domesticus (a pig)! That’s right; we are procuring a swine for each other – kind of a mutual gift which expresses our deep and sincere love for one another. At Christmas ’08, we decided to keep spending to a minimum. Since neither of us needed anything, we didn’t but gifts for each other. Some people may find this a little cold-hearted but we didn’t think so. It was quite liberating to avoid the pressure of having to buy something clever and original. We really enjoyed the simplicity of focusing our attention on more important things. And just in case any of you think that this is just my slacker way of getting out of buying something for Letha, just ask her, she agreed 100%! Our approach this year will be a little different. Since we both already own more than we want and there are no needs in our lives for material things, we are looking beyond ourselves. Through some ongoing ministry projects we are involved in, we are aware of some other people who are in need this year. We are buying a pig (including all the accoutrements and accessories) for Casa Shalom orphanage in Guatemala. The leaders there are beginning to invest in ways that can reduce operational costs and make the home less dependent on outside support. They recently constructed a chicken farm and added a stall for a pig. They plan to raise the pig and, when it is fully grown, use it to feed the children at the home. So our gift to each other this year will feed some hungry kids. We are also checking into getting some chickens and possibly a cow for another organization. I am not suggesting that you follow our lead on this one. This is a personal decision and I would really hate to be responsible for someone in your family being very disappointed on Christmas morning. If you are thinking about something similar, I suggest you discuss it thoroughly with the people in your life. Don’t surprise anyone with a pig under the tree. However, if you would like some creative gift ideas, check out The Heifer Project, Christmas of Compassion, The Moju Project, Bibles Unbound, and Compassion International. I would like to give the pig a name and am open to suggestions. I am running a “name that pig” contest on facebook. The winner will receive (once again, drum roll, please) … the honor of naming the Christmas pig! And if you suggest the name Rick, I will unfriend you!